Beverley Continues To Build Links With Japan | HU17.net – It’s all about Beverley! 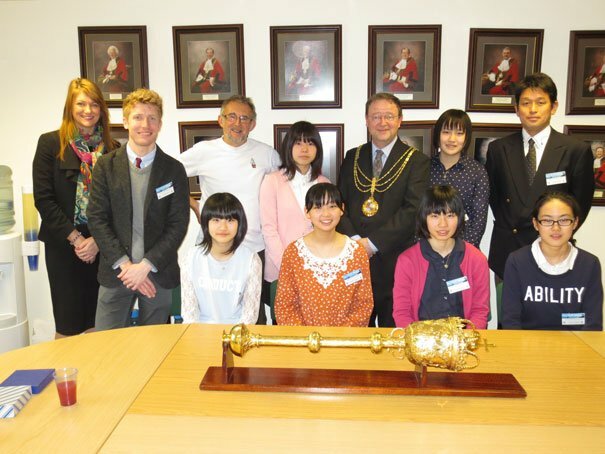 Mayor of Beverley, Cllr Martin Cox hosted a reception at Beverley Town Council to exchange gifts with a party of young Japanese Students from Takaoka and their escorts. Takaoka, to the north west of Osaka, has a long history of friendship with Beverley, first visiting in 2000 during Cllr Neville Holgate’s mayoralty. Several Groups have since made home-stay visits hosted by willing families in Beverley. All the girls attended Beverley High School and met “buddies” who helped them through the school timetable. The six girls also made visits to York, Hull and Leeds as well as enjoying Beverley’s unique charms. The two adult representatives of Takaoka Council similarly enjoyed football at the KC Stadium, a fund raising race night and a traditional pub quiz. Despite adverse weather, a farewell bonfire party was well attended and highlighted the warmth of relationships established during their weeklong visit. Having filled their luggage allowance to capacity with shopping and gifts to take home, the group flew out from Humberside Airport on Thursday morning to a chorus of Sayonaras!